This happens more often than I like it to. Just add the baking soda to the wet pan. I make popcorn and a smoothie almost every morning for breakfast. The popcorn gets popped on the stove in the pot you see pictured here. Sometimes I let the pot get too hot and some of the canola oil ends up solidifying on the bottom of the pan. 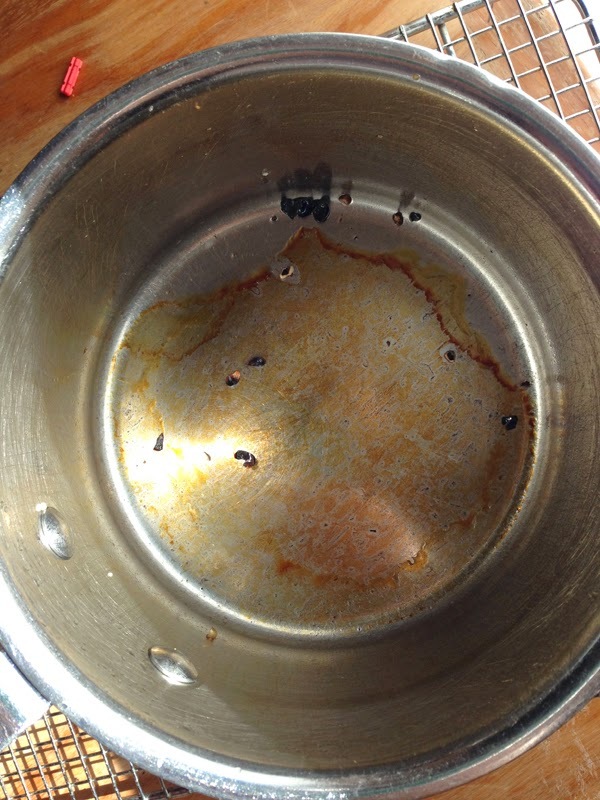 I've recently discovered a way to get that sticky stuff, and other baked-on, cooked-on stains off my cookware. The solution was right in my cupboard: baking soda. If the stain is on something you've just cooked, allow the cookware to cool off enough to touch, but don't let it cool completely. If it is something that's already cooled or had the stain for a long time, run some hot water over it to heat up the stain. 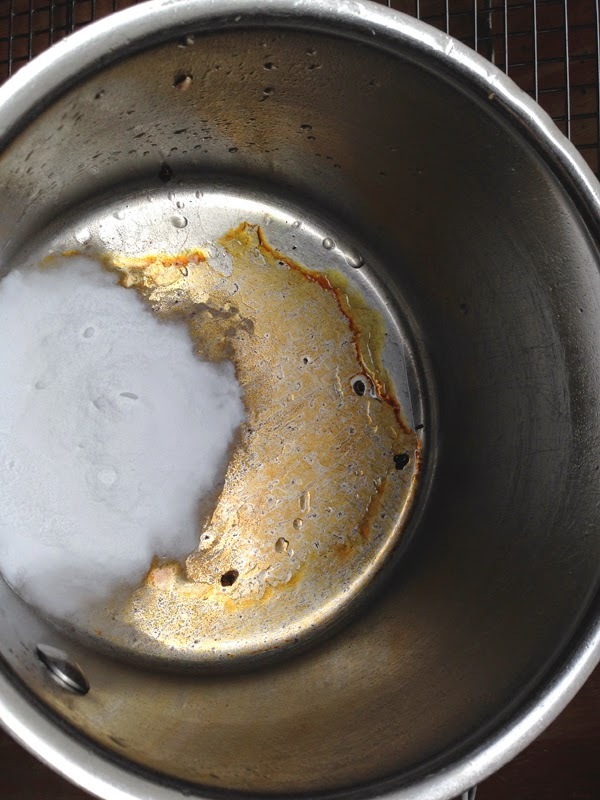 Make sure the cookware is wet and sprinkle on a good amount of baking soda. Add water if needed to make a sandy paste. Using an old dish sponge, scrub the baking soda over and into the stain. You should notice it starting to smear and lift off immediately. 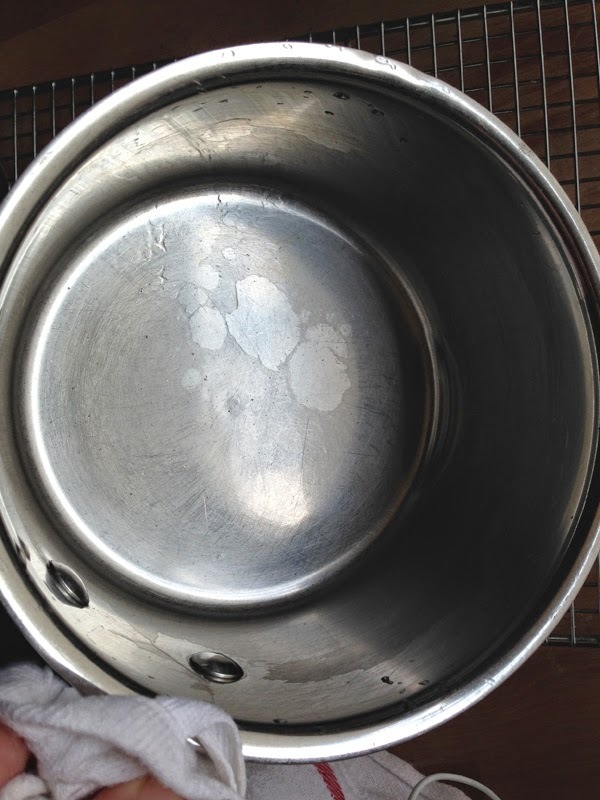 Some stains are tougher than others, but I always get the gooey oil residue out of my pots and pans this way. I've also done this on Pyrex--you know, the brown stains on the edges that won't go away? The baking soda works. Of course, the more stained it is, the tougher it will be to remove it, but once it's clean, you can keep up with the baking soda treatment to keep it clean. Anyway, there you go. Hope it's a helpful tip! P.S. Baking soda has also worked great for getting food and stains off of my Le Creuset cookware and my Pampered Chef stoneware. I find it very interesting that you make popcorn for breakfast. I sometimes make popcorn for dinner because I am a photographer and it's easy to eat while I edit. But - I would have never thought to have it for breakfast. You're just too cool!